"Country Music's Biggest Night" is just a little over a night away. 2013 CMA Awards Tickets are now available at discounted costs at Epic Nation Tickets. 2013 CMA Awards Tickets are now available at discounted costs at Epic Nation Tickets. Country music’s biggest night is just a little over a month away and if history tells us anything, country music fans will not want to miss out on this. The CMA Awards tend to be one of the most exciting nights of the year as the biggest stars in country music convene under one roof for an amazing night of live music and awards. For an event like this, tickets tend to be some of the most sought after tickets in all of music. For that reason, Epic Nation Tickets is just now releasing affordable CMA Awards tickets to the public. When one thinks country music, they think Nashville, and the CMA Awards will not be straying away from that idea. On November 6th, the eyes of the world will be on the Bridgestone Arena in Nashville, where the biggest names of country music will come together for what is sure to be a big party. Again hosting the 2013 CMA Awards will be none other than the hilarious duo of Carrie Underwood and Brad Paisley. For country music fans, this is a dream for most, as countless number of stars will be in the house for this amazing night. It is imperative for country music fans to purchase CMA Awards tickets now from Epic Nation Tickets before all tickets are sold out. Nominations for the 2013 CMA Awards are already out and if the nominations ring true, country music fans can expect many stars to be in attendance that night. Receiving nominations to “Country Music’s Biggest Night” includes a list of Kasey Musgraves (who received 6 nominations), Blake Shelton, Florida Georgia Line, Keith Urban, Jason Aldean, Luke Bryan, Tim McGraw, Eric Church, Little Big Town and more. Discount CMA Awards tickets can currently be found at Epic Nation Tickets. 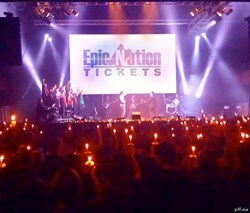 Epic Nation Tickets is the best source for discounted tickets to concerts, sports, Broadway shows and Las Vegas acts. All ticket transactions come with a 125% guarantee and impeccable customer service.